explore the many natural beauties and adventures itacaré has to offer! 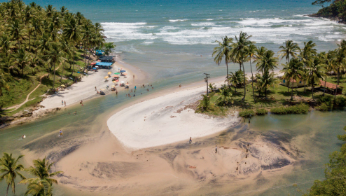 ETIV do Brasil has partnered with local leading tour agencies and operators such as Brazil Supremo Turismo and Ronan Rover to offer our volunteers and interns the best tours with the best prices! The tours include white water rafting; hikes through the Atlantic rainforest until secluded, unspoiled beaches; whale watching trips; boat tours; snorkeling; visits to cacao farms; waterfalls adventures; sea and river kayaking; surfing and much more! There won't be shortage of adventures, activities and places for you to explore on your free time; in fact, the challenge will be to have time for everything Itacaré and region have to offer you! We have also joint forces with the Itacaré Canoeing Center to offer a full day kayaking experience for just U$20 (per person). The trip includes a guide, a visit to a stunning waterfall and one entire day exploring the picturesque Contas River, which cuts through mangroves, cacao farms and the Atlantic Rainforest! Book your volunteering now and have an experience of a lifetime in one of the most beautiful places in Brazil!